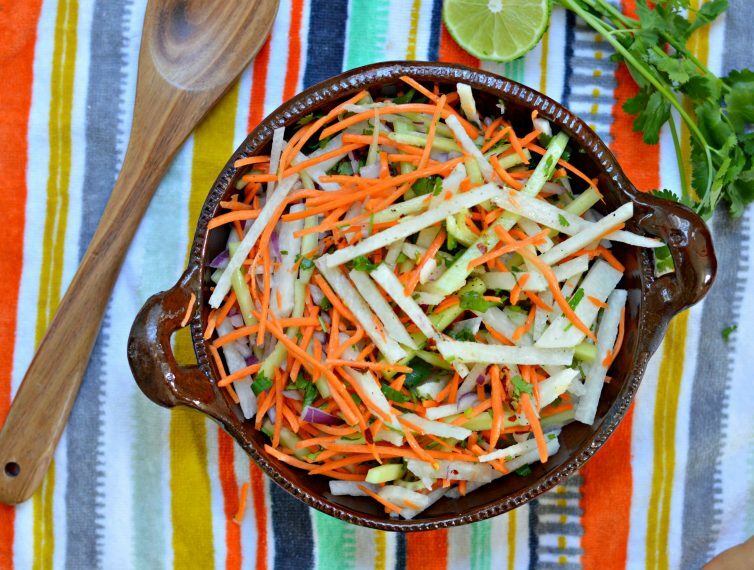 This Jicama and Cucumber Slaw is a perfect side dish for all of your summer favorites – it is fresh, crunchy, and delicious. Cinco de Mayo festivities are almost here! In celebration of that, I want to share a recipe with you today that uses a very Mexican ingredient – Jicama. 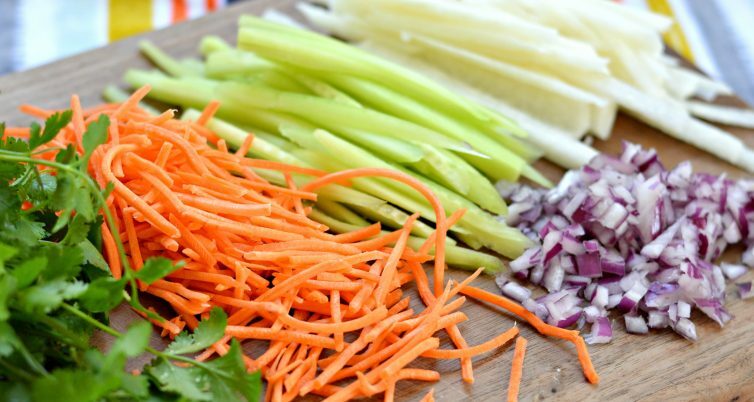 This recipe is perfect for the sunny days that are on their way – it is fresh, crunchy, healthy, and delicious. You can use it as a side dish for pretty much any dish, as a standalone meal, or as a topping for these delicious fish tacos. Jicama looks somewhat like an onion, but it is much larger and the taste is much different as well. It is juicy, crunchy, and sweet. In Mexico, we tend to eat it raw with lime, salt, and chili powder. You can find it pretty much anywhere in Mexico, including as part of many kids’ lunches cut into thin strips and combined with mango and cucumber. These are great school snacks! Because of its high water content, jicama is perfect to enjoy on a sunny day. That would definitely explain why it is consumed so frequently in Mexico, seeing as how there are very few places in Mexico that are not hot most of the time. Another good thing about it is that it is high in Vitamin C and and it combines perfectly with other healthy ingredients such as carrots, onions, and cilantro. It goes really well as a side dish with all of your grilling favorites. At the same time, you can just serve it as a salad for lunch and I know you will be satisfied. 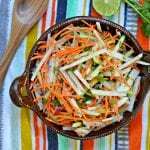 Jicama is one of the principal ingredients in this jicama and cucumber slaw. 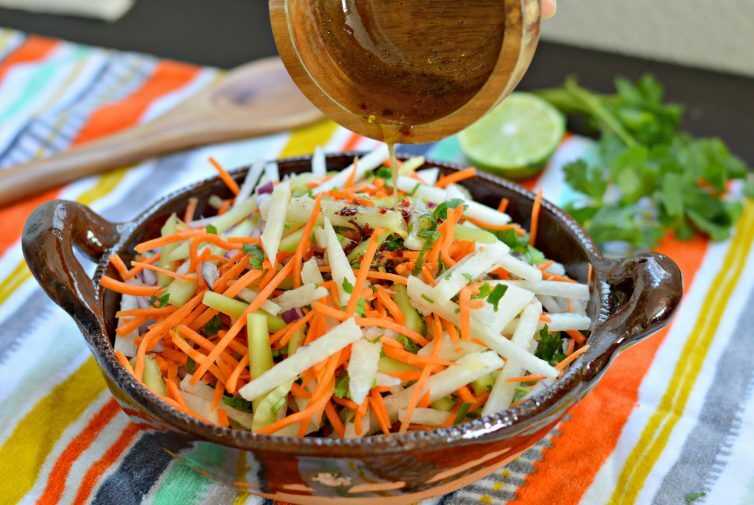 For this recipe, I included a sweet and spicy dressing, with just a bit of spiciness. Of course, you can omit the spicy ingredients if you aren’t into it. It is also important to note that you can eat jicama cooked or raw, and even grilled along with some delicious nopales – but that will be a recipe for a different day. 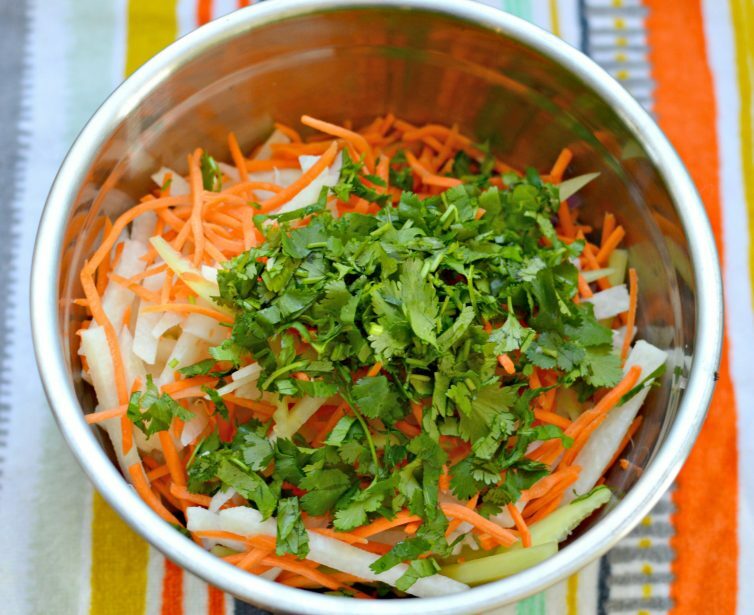 For this jicama and cucumber slaw, just cut up the veggies shown in the recipe below, add the dressing, and enjoy! Let me know what you think in the comments below. 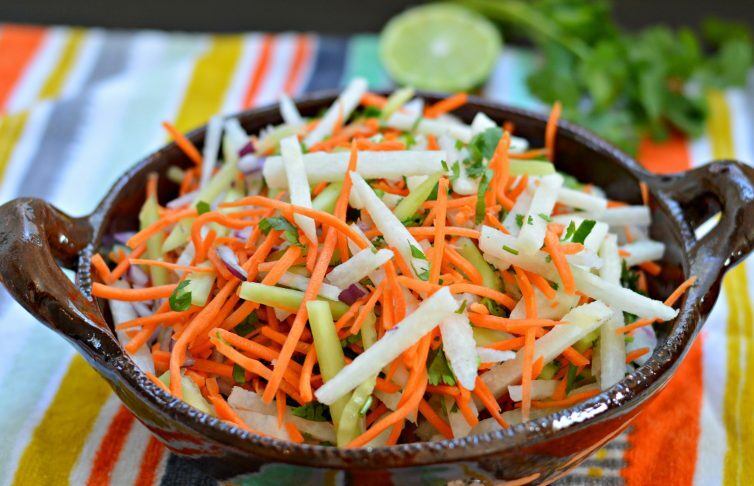 Jicama and Cucumber Slaw is an amazing choice for a quick, healthy meal. 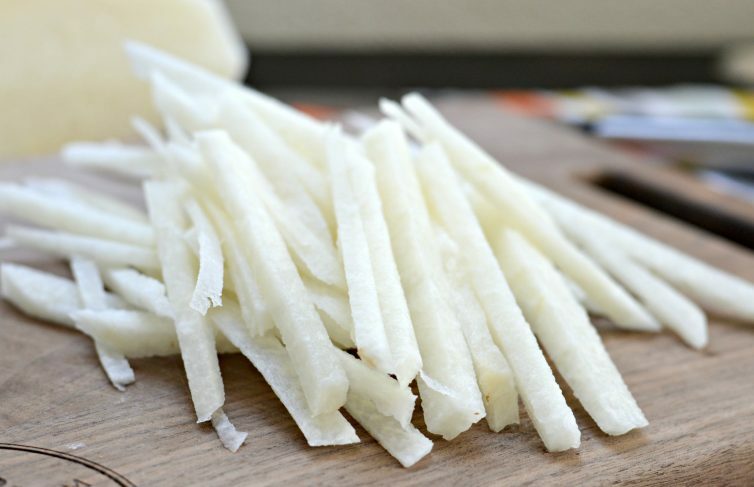 1 Jicama peeled and cut into thin strips. 1 cucumber peeled, de-seeded, and cut into thin strips. In a small bowl, mix all of the ingredients for the dressing and set aside. In a large bowl, combine all of the ingredients, and then mix in the dressing.